During a recent trip to Iowa, I enjoyed a lovely afternoon getting to know, Karen Langstraat, a woman who has been telling her story through Stonecroft Ministries for many years. She shared much wisdom and encouragement with me that day. And as we parted company, she presented me with a challenge. She disappeared into a little room off the kitchen and returned with a plastic shopping bag stretched tight under the weight of a payload that was nearly falling out. She extended her hand and offered me the bag. One of the biggest zucchini I had ever seen swung heavily between us. I looked into her eyes and knew I had but one choice–to accept her challenge. As my husband and I drove across the rolling landscape that evening, the sun set on another speaking circuit. This trip home felt different. While I normally returned to the regular rhythms of life, the overgrown squash in our back seat foretold a different story altogether. The next day, I had my first face-off with the Green Giant. I paced back and forth, sizing it up. What would I do with seven pounds of squash? That’s the great thing about a challenge. It invites you to look at circumstances in a new way and provokes you to action you’d never attempt otherwise. Sure, there was zucchini bread. But this was an opportunity for my spirit to rise to a new level of creativity. I wasn’t about to quench a spark that could set my mundane morning routine ablaze! Hmmm, I brushed some flour off an old standby, the muffin recipe I can practically make in my sleep. What would happen if I changed things up a bit? Say, throw in some shredded zucchini and cranberries and, and… I yanked open the cupboard door and found a bag of mini chocolate chips! Yes! I could stir it all in and transform my usual breakfast into a gourmet feast. I marched straight to the cupboard where I keep my grater. I seeded and shredded two heaping cups of zucchini. Soon, I was plopping the stringy dough into muffins tins and, before I knew it, the sweet aroma of chocolate and cinnamon filled my kitchen. Tangy cranberries and gooey chocolate chips; ooh, wouldn’t they taste wonderful! 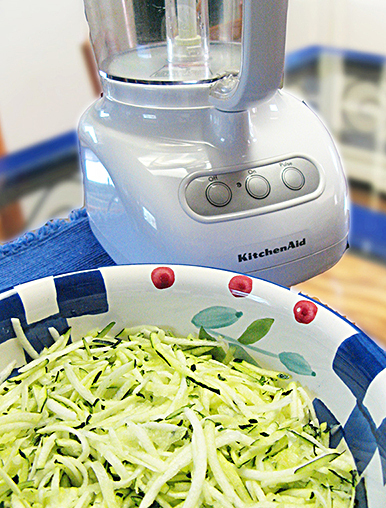 And how could I forget–the redeeming health benefits of those two heaping cups of shredded zucchini. Never underestimate how “good for you” a challenge can be. I returned to the zucchini gleaming under the flourescent kitchen light. It cast a shadow that stretched across the counter and clear up the wall. Alas, I’d hardly made a dent in it. I’d started so well and it had all seemed so easy. I now realized that this was going to take more work than I’d estimated. Aren’t challenges like that? Once you get into them, you wonder if you’re in way over your head. Let’s face it, it’s crippling to look at the whole zucchini. Sometimes, it’s better to cut that bad boy down into manageable pieces and simply tackle the next one. I focused on finding one more recipe. Simple, I sat and googled up over 11 million alternatives in .13 seconds. I clicked through a dozen or so zucchini recipes until I found one that sounded amazing: Curried Apple-Zucchini Soup. Although it was early August, hot and humid, anything with curry in it is worth sacrificing for in my book. That’s the beauty of a challenge. It brings out that part of you that’s willing to sacrifice and when you sacrifice, you’ll likely reap some sort of reward. After enjoying the curry soup, I was left staring at an awful lot of zucchini. How much more of this can I endure? Well, I sighed, I guess it wouldn’t truly be a challenge if I could breeze through it, just like that. It was time for my practicum in perseverance. I reminded myself that this was the training ground where I’d cultivate the staying power I needed for overcoming future obstacles. Now, if you’re wise, you won’t hesitate to ask for help when faced with a challenge. That’s exactly what I did. I called my sister. After a lot of un-huh’s and scribbling down notes, I hung up, armed with a recipe–guaranteed to be out of this world–and pumped with enthusiasm to spare. Finding someone who’s been down the path before you, who can share sound advice and encouragement along the way, is indispensable when facing a challenge. Touche! I cut off another big chunk of zucchini and diced it up. Then, I heated a pan and sauteed chicken with red peppers and onions. Finally, I stirred in the zucchini and sprinkled cumin and salsa over a sizzling pan of goodness. Mmmm, its aroma swirled through the air. After dropping colorful spoonfuls onto oven crisped tortillas, I sprinkled each with cheese and slipped the tostadas under the broiler. Minutes later, we enjoyed a heavenly meal. Over the next few days I called out for help via facebook and friends responded with their ideas. A zucchini chocolate chip cookie recipe my friend Becky recommended caught my eye so that’s the next one I tackled. 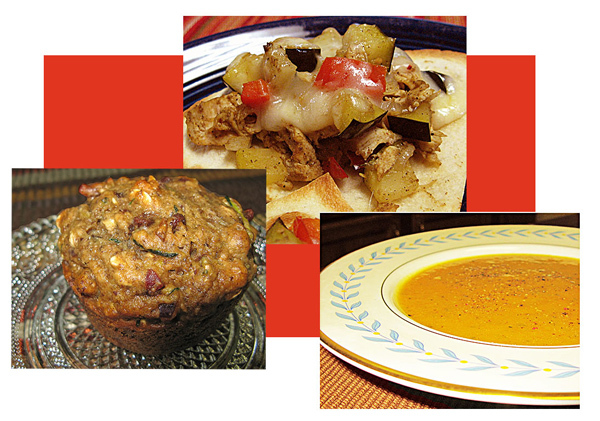 You know, it felt good to be adding some new recipes to my repertoire. After pulling the last pan of cookies out of the oven, I glanced toward the bowlful of shredded zucchini that remained. That’s it! I just can’t stand to make another thing! Then I remembered that I had mentioned to my friend, Karen, that I was writing a post about how I dealt with the zucchini she had given me. Accountability, it’s a powerful thing! I could have easily let the last few cups go to waste, but telling someone what I had set out to accomplish propelled me on toward victory when I was ready to give up. So, I made more cookies! Over the last few days I’ve recognized you can learn a lot about dealing with life’s challenges by tackling a ginormous squash from a friend. It’s funny, Karen had no idea what handing me that zucchini would unleash in my life. All fun and zucchini aside, think about it: How many women around you are languishing in their everyday lives, desiring to live life on a whole new level? Maybe, they just need a challenge. Wait a minute, wait a minute, hold those zucchini! How about challenging a friend to do something that’s just outside her comfort zone? Or to set a goal for yourself that will help you overcome an obstacle you’ve looked at for a long, long time? Maybe you can come back here and find some encouragement tucked in this post as you take on a challenge. It was nice to see you on the home page today. I loved that poem of Murray’s. Off topic is just fine. I stopped in and enjoyed the new look over there–wonderful! I enjoyed the poem, too. Her fortune cookie truck turnover…vivid picture that told a story–so many peoples’ stories–in one sentence that I read again, not for clarity, but because of the beautiful clarity from start to finish. Your humongous zucchini picture makes me laugh out loud! Jennifer, You live in the country…you know how big those zucchinis can get and how willing our friends and neighbors are to share them by the sack-full. I had fun at the Twitter party! Hardly had time to shake the maracas though–so many tweets coming through that I needed my track shoes on to keep up. Glad to see all the enthusiasm for The High Calling. Hey, and thanks again for the invite. It feels good to belong. I’ve got one of those ginormous zucchinis in my kitchen. It’s impressive; people comment on it when they visit. I’ve considered inventing a ball game that utilizes zucchinis as bats. You’ve inspired me to start hacking off sections and creating something with it. Ann, I think that the ball game would be a lot of fun for those medium-size ones. But the ones that people give away are usually the size of battering rams and might be better suited to log rolling contests held at the local swimming hole. Little cold for that now though, so cook away! For any bloggers reading this comment, note that this is a blog carnival, so hop on over and join the food fun. Ball bat-size zucchinis not required. Ann, thanks for stopping in! Bon Appetit!